I like using the blog for something purposeful. Sometimes I envision this space as a bulletin board, where I tack up postcards or random items of interest whose only connection is my scattered mentality. Sometimes the blog serves as a spotlight or magnifying glass, to highlight a topic or an individual artist. But what if the blog could function as a curatorial space? I don’t have walls on an on-going basis, or a budget to import, frame, hang, and publicize (or publish, in the quasi-gallery of ink on paper), but I can use the virtual display space to draw images together and present them to the public. I know, I know, this is all so old-hat, you correctly remind me that I needn’t bother dwelling on metastructural issues like this. Just bear with me as I rationalize a new venture. New at least for me. GREENER is a similar conceit, though more positivist in its program. What I will do under this banner is present work that celebrates a world recovering its more natural, greener, organic self. Over the years I’ve been increasingly drawn to work that pushes, nudges, subtly advances an agenda; the agenda I favor is one that has all of us thinking about things we do that can help sustain the planet rather than exploit it. I will start my GREENER program in the next few days. Take a look, and let me know if there are projects I should know about. p.s. 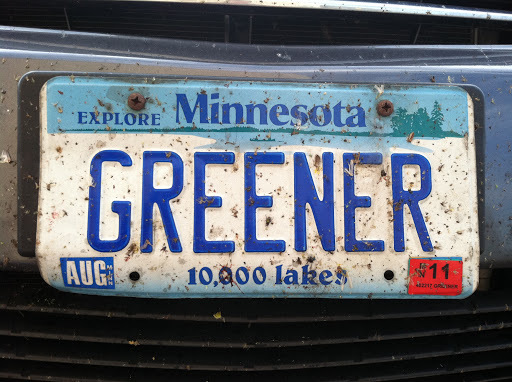 I know that my Prius is still a car, but as a hybrid it’s greener–and stingier with gas–than most. Hence the vanity plate.